How much does the Milky… weigh? 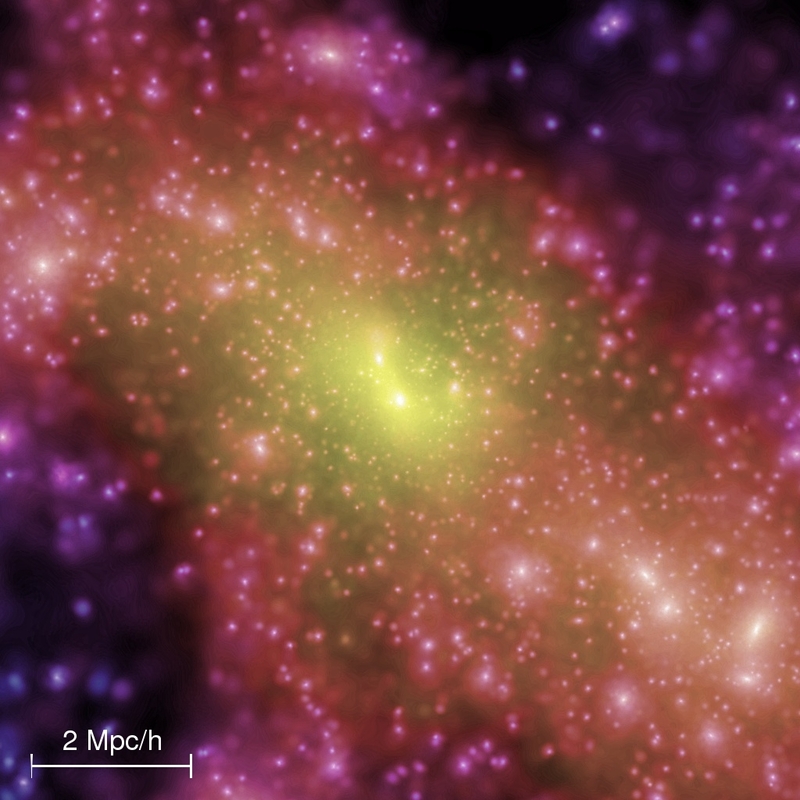 Title: What galaxy masses perturb the local cosmic expansion? 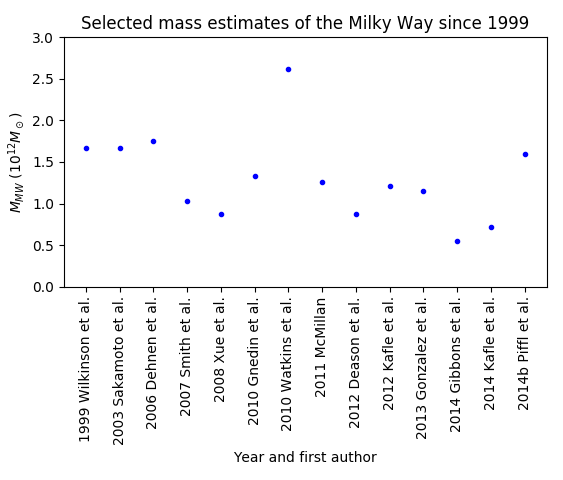 Figure 1: Fourteen recent mass estimates of the Milky Way produced since 1999, obtained through a variety of different methods. Note how the estimates vary significantly from each other, by up to a factor of 5. Figure adapted from Table 8 in Hawthorn & Gerhard 2017. Like other galaxies, much of the Milky Way’s mass comes in the form of dark matter, which is a bit of a bummer, because we can’t see it. What we can see are visible objects – like stars, gas clouds, or dust particles – whose motion is a tell-tale for the dark matter density around them (this Astrobite and this one provide a great overview of how this is done in practice). So in order to measure the total mass of the galaxy (often referred to as the galaxy’s virial mass), we need to find observable objects all the way out to the galaxy’s edge. The issue is that out at the fringes of our galaxy, visible tracers are few and hard to find. This is one of the main causes of the large uncertainty in our estimate of the Milky Way’s mass. Fortunately, there are a few other theoretical approaches to measuring the total mass of a galaxy. And these methods do not rely as heavily on observing faint objects at the outskirts of galaxies. Today’s paper discusses several of these, and specifically one that involves measuring the mass of a galaxy based on how it perturbs the local Hubble flow (or in other words, how its gravitational force affects the motion of other galaxies far beyond its own boundaries, where the expansion of the universe is the dominant effect). In theory, the mass derived from the perturbed Hubble flow is equal to the virial mass of the galaxy, which could be a big deal because we can theoretically calculate the mass of the Milky Way without needing to find faint objects at the edge of the galaxy! To test the relation between the mass measured from the Hubble flow and the “true” virial mass, the authors of today’s paper tried both methods on pairs of simulated galaxies with similar characteristics to the Milky Way and Andromeda. Specifically, they examined a set of 12 simulations of the Local Group system called the APOSTLE models (see figure 2). For each model, they first measured the mass enclosed within the boundaries of each galaxy (shown by the two dotted circles in each of the panels in figure 2). Next, they studied the motion of large objects far outside the galaxies’ boundaries, from which they determined how the Hubble flow is perturbed. Using this data, they obtained an estimate for the total combined mass of the pair of galaxies that accounts for this perturbation of the Hubble flow. Figure 2: 6 of the 12 APOSTLE simulations. The two dashed circles represent the boundaries of the galaxy equivalents of the Milky Way and Andromeda, and the solid circle represents a 3 Mpc radius around the pair of galaxies, inside of which one can measure their influence on the Hubble Flow. Figure 2 in the paper. But there’s a hitch: in theory, the mass inferred from the disturbance to the Hubble flow should equal the combined virial masses of the two galaxies. 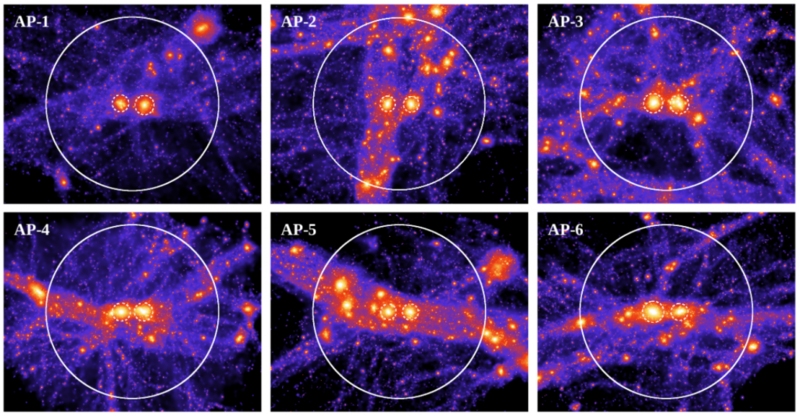 Yet the simulations reveal that the Hubble flow mass is systematically larger than the sum of the two galaxies’ individual masses, as can be seen in the left-hand panel of figure 3. The authors note that this is not entirely surprising, since the dark matter halo is expected to extend past the boundary within which the galaxy’s virial mass is calculated. So the mass obtained from the Hubble flow method should be larger than the virial mass. Based on previous work, the authors estimate the extra-virial mass contribution, and show that adding this additional contribution to the virial mass of each galaxy provides the necessary correction and reconciles between the virial mass estimates and the Hubble flow mass estimate. This correction is shown in the right-hand panel in figure 3, which demonstrates a significantly better correlation than the left-hand panel. 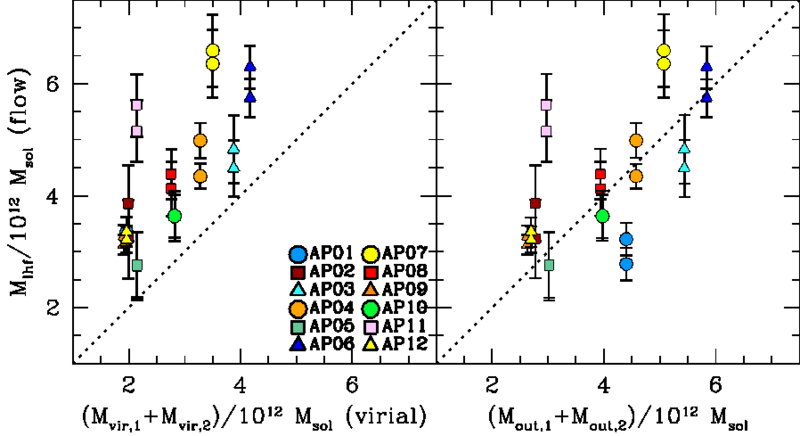 Figure 3: Comparison of the mass deduced from how much the Hubble flow is perturbed, to the combined virial masses of a pair of galaxies, for each of the 12 APOSTLE simulations. The left-hand panel compares the Local Hubble flow mass to the traditional virial masses of the pair of galaxies, while the right-hand panel adjusts the virial masses to include the extra-virial mass associated with each of the galaxies. The dotted line in each panel represents a 1:1 relation. Figure 5 in the paper. Armed with the extra-virial mass correction, the authors return to our original question: “How much does the Milky Way weigh?” Using observations of the Hubble flow around the Milky Way, they are able to provide a mass estimate that is in line with other existing measurements of the Milky Way’s mass (hooray!). However, it turns out that the uncertainty in their value is even greater than the uncertainty associated with previous measurements of the Milky Way’s mass. At first it may seem like this was all in vain, but don’t lose heart! Science is made stronger through providing multiple, independent methods of calculating the same quantity. And this paper makes an important contribution to doing exactly that! We now have one more wrench in our growing toolbox of methods for measuring the mass of a galaxy. Who knows, maybe one day measuring the Milky Way’s mass will seem as trivial as stepping on the scale for your doctor.